We do not have the rain issues where I am, but we do store our wood covered. A friend gave us a sign from the road signs~you know~the adverts on the highways. It is a tarp like fabric that is HUGE. We folded it over and built a covered area for the wood next in line to burn. We sloped the top a bit, in case it rains or snows as we do experience a few days of each~every year. Yeah the sheet covering our wood is from the side of a lorry so it's always good to recycle! We maybe have more rain days than dry ones in some seasons! 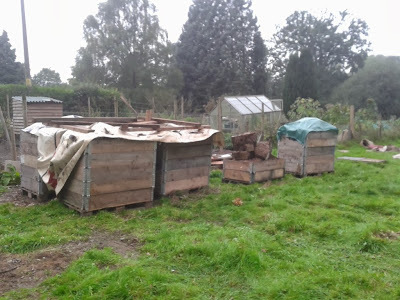 We are getting organised with our wood, with a huge old oak tree just felled and the wood from half an apple tree and some more oak we know we will be warm as toast in three years to come but for this year we have (up to now) only two trailer loads of wood, tipped under a tarpaulin in the woods at our new place, we must be the only people to take two trailer loads of one wood to another!! We do have an excuse and the best one, ours is already seasoned, so it was well worth taking. 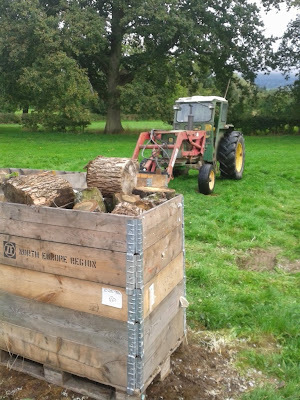 Our new tree expert and surgeon in Wales 'Dai the Log' told us that wood should be left where it is felled, scattered on the ground for the first year, so the rain can naturally wash out all the tannins, and then split and stacked for the second year with top and side cover and then covered every side except the front for the year you want to burn it. We're giving it a go with the newly felled wood. Maybe with oak for leaving it exposed to wash out the tannins but something like ash is ready to burn a year after its cut. Once wood is cut and split it will dry quite fast. We're burning wood we cut last year and it's burning easily and my brother sells a lot of firewood and most of that seasons in year once it's cut and split (of course it depends what season you felled it as summer wood would take a lot longer to dry as there is more sap in it). I don't blame you for taking your firewood up there - if you put the effort into getting it in the first place you might as well have the benefit of the heat it's going to give you!